On August 25th 2018, the Spanish government approved a decree to exhume Franco’s remains from Valle de los Caídos. What transformations are needed to re-signify the controversial monument of Valle de los Caídos? 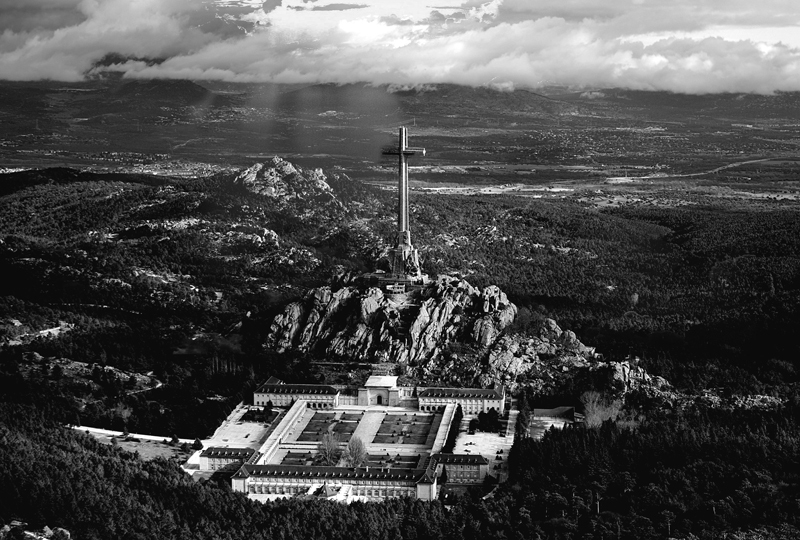 Valle de los Caídos (“Valley of the Fallen”) is the large-scale memorial monument close to Madrid for the “fallen” of the Spanish civil war, conceived by the Spanish dictator Franco and constructed partly by Republican prisoners of war. Today, the future of this monument is in the center of a broad public debate in Spain. Hybrid Space Lab is organizing the workshop Deep Space focusing on how to transform and re-signify Valle de los Caídos, the Francoist monument in the Sierra de Guadarrama close to Madrid. Valle de los Caídos: a 152 meter tall cross and basilica, a 263-meter long crypt, is one of the worlds most controversial monuments. The workshop Deep Space takes place at Medialab Prado in Madrid on 25, 26 and 27 October 2018. The international interdisciplinary program initiated and curated by Hybrid Space Lab aims at developing creative processes, concepts, and ideas that can break through and transform the symbolic power of the site. The workshop Deep Space is organised together with Dr. Paco Ferrandiz from the “Spanish National Research Council (CSIC)” who was part of the Spanish Government Commission of Experts for the Future of Valle de los Caídos (Comisión de Expertos para el Futuro del Valle de los Caídos). The workshop Deep Space brings creative professionals (such as architects, landscape architects, media designers, visual and sound artists, performers, curators, and theatre makers) together with art- and architecture historians, ethnologists, forensic archeologists, heritage and cultural studies experts, and psychologists and psychoanalysts. A special focus is on digital tools such as Augmented Reality, Virtual Reality, Mixed or Hybrid Reality and Augmented Virtuality, as they offer the possibility to process the transformation of such a monument without physical intervention. Deep Space is a long term program exploring the potential of state of the art digital technologies for dealing with historical heritage and politics of memory. Participating are, next to Dr. Paco Ferrandiz, Associate Researcher in the Institute of Language, Literature and Anthropology (ILLA) at the Spanish National Research Council (CSIC) amongst others researchers, experts and institutes from Spain, the Netherlands, France, United Kingdom, USA, Greece and Germany such as Marie-Louise Jansen and Director Dr. Timothy Ryback from the “Institute for Historical Justice and Reconciliation” in The Hague /Paris, Director Prof. Dr. Frank van Vree from “NIOD, the Institute for War, Holocaust and Genocide Studies” in Amsterdam, Prof. Dr. Matthias Rauterberg, Professor for Interactive Systems Design at the “Technical University Eindhoven”, Dr. Margriet Schavemaker, Curator and Head of Research and Publications at the “Stedelijk Museum” in Amsterdam, Prof. Dr. William Swartout from the “USC Institute for Creative Technologies” in Vista, California, Prof. Andrew Hoskins from the “University of Glasgow, College of Social Sciences”, Chris Dercon, Belgian Art Historian, Curator and former Director of Tate Modern, Prof. Dr. Miguel Angel Gonzalez Torres, Psychoanalyst and Psychiater from the “Universidad del País Vasco”. and Dr. Alfredo González-Ruibal, contemporary archeology and ethno-archeology, Institute of Heritage Sciences (Incipit) at the “Spanish National Research Council” (CSIC). The combination of physical and media space, of local place and digital networks, is coined Hybrid Space. Space today is transformed by technologies such as Augmented Reality (AR), Virtual Reality (VR) or Mixed Reality, becoming increasingly hybrid. With the Internet of Things (IoT) Hybrid Space is becoming ubiquitous. Artificial Intelligence and Big Data have the ambition and potential to algorithmically manage these Hybrid Spaces. Hybrid Space Lab is a Think Tank and a Design Lab, a cultural breeding ground for incubating breakthrough concepts and fostering innovation contributing to positive societal change.